They say Filipinos have a sweet tooth...but who doesn't? I guess a lot of people whether Filipinos or not are born with it! I, for one, am a big fan of sweets (though hard candies are excluded)! I like chocolates, cakes, cookies and all sorts of pastries. But I don't like them too sweet. I always look for something with just the right amount of sweetness in it. 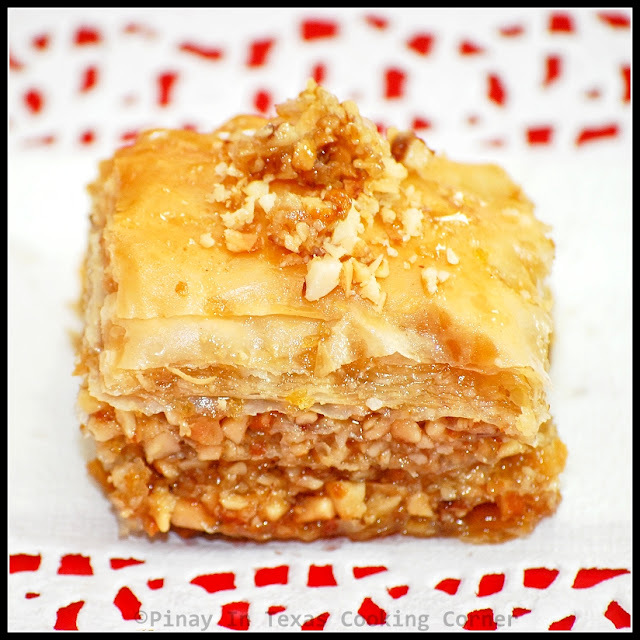 When I first had Baklava years back at a friend's party, I liked it instantly. It was so new to me, and the crisp and the nuts in it made me kinda addicted to it. It's good that we can always get it from Costco. But it's way too sweet, that after a few times, we don't buy it that frequent anymore. Thinking that it's something complicated to make, I never dare to try it. 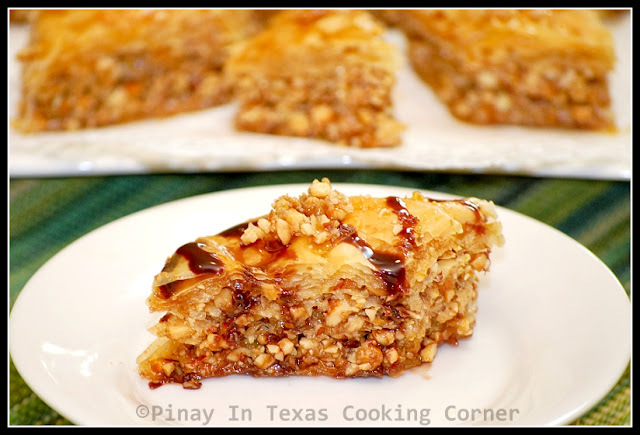 I was so glad when I found a Baklava recipe from another blogger whose recipes I trust to be always good. I'm referring to Sandra of Sandra's Easy Cooking! I found her blog not so long ago...but within that short span of time, I came to admire her and the recipes she shares through her blog. 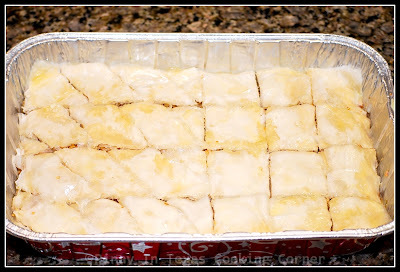 When I saw her Homemade Sweet Baklava recipe, I realized that making homemade Baklava is pretty easy. I got the chance to try it last Wednesday. It came out really good though kinda too sweet for my family's taste buds, and a little soggy. 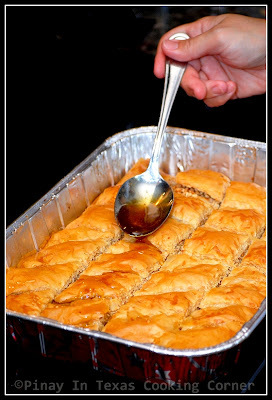 Last Saturday, there was this potluck dinner party that we had to go to...and I thought of making Baklava again. But I used less sugar, just 1/8 cup for the nuts...and instead of adding ¼ cup sugar in the syrup, I didn't...I reduced the water to ½ cup and just let the honey work on the sweetness. It came out just perfect with just the right crisp and sweetness! For the potluck party, I put each slice of Baklava in a cupcake liner for easy serving! It was a hit! Thanks so much to Sandra...I wouldn't have known how easy it is to make Baklava if not for her! For her original recipe, click here. Be sure to check her other recipes too...I tell you, they are all mouthwatering! I'm sharing this on Savory Sunday, Sweet Indulgences Sunday, Yummy Sunday, Mangia Mondays, Mouthwatering Mondays, Hearth and Soul Hop Hub, Temp My Tummy Tuesdays, Tuesdays At The Table, Delectables Tuesdays, Tasty Tuesdays, These Chicks Cook and Cast Party Wednesday. 1. Make the syrup before you start working on the baklava. It will give enough time for the sauce to cool down. Bring water to a boil. Add honey, lemon zest and vanilla extract. 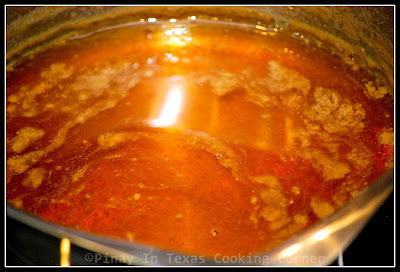 Simmer for about 20 minutes or until the syrup becomes thicker. Set aside. 2. 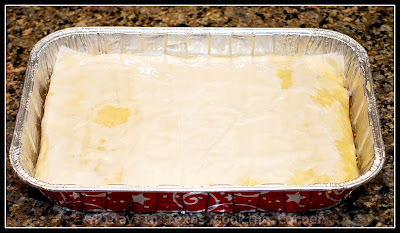 Preheat oven to 350 degrees F. Butter the bottom and sides of a 9x13 inch pan. 3. Mix nuts and sugar together. Set aside. 4. 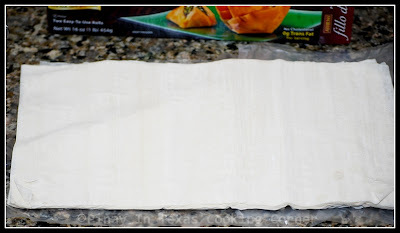 Unroll phyllo dough and trim the whole stack to fit the pan. 5. Cover phyllo with a dampened cloth to keep from drying out as you work. 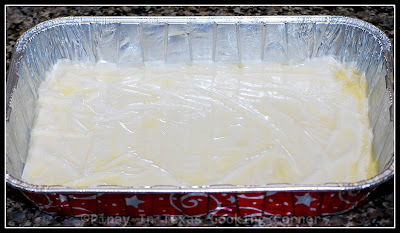 Place 5 sheets of dough in the bottom of the pan and butter generously. 6. Sprinkle 3 Tbps of nut mixture on top. 7. 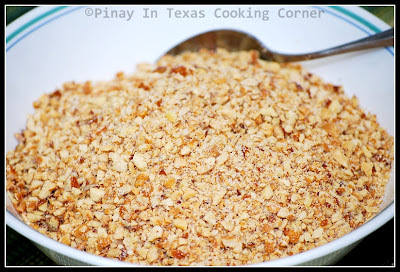 Put 9 more sheets and in between, butter it just a little and sprinkle with 3 Tbsp of nuts. 8. 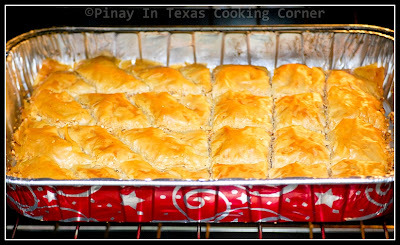 Top with 8 sheets of phyllo brushing with butter in between 2 sheets. Brush the top generously with butter. 9. 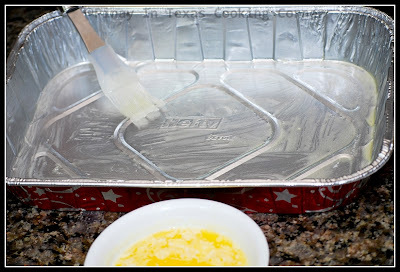 Using a sharp knife cut into diamond, square or triangle shapes all the way to the bottom of the pan. 10. Bake for about 40 minutes or until baklava is golden and crisp. 11.Remove baklava from oven and immediately spoon cold syrup over it. 12. Let cool. Put in cupcake liners or just serve in a platter. Tina! You did a great job. 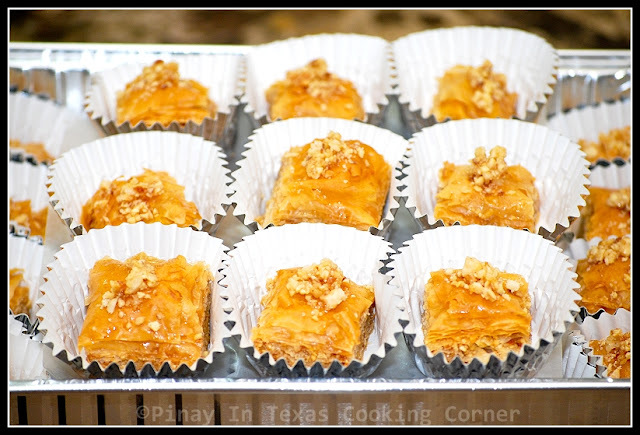 Your baklava is gorgeous! I know that it has to be delicious. Thanks for sharing on A Well-Seasoned Life's Sweet Indulgences Sunday. Hi Tina, I am glad that you made baklava..I do understand about sweetness as in my tradition baklava suppose to hit you in the brain with sweetness, that is why we are not making it so often. I do reduce sugar from time to time especially in summer time..but you did figure how to adjust it your own taste buds. Thank you for picking my recipe!!! Well, you little clever baker you! They look scrumptious. And the changes on your blog look great! Gorgeous looking Baklava .. can only imagine how yummy it will taste ! Hi Tina! You are so quick making Sadnra's Baklava! She must be very proud of you. I can tell you are experienced baker because you can adjust ingredients for baking. I have no idea how you do that without tasting it... like food, we can adjust while cooking and we can taste, but for baking, you never know until it comes out of the oven. Must be from your experience. I'm just impressed by simple things like that when it comes to baking... Great job! Lovely and delicious although a small piece will be enough for me. Great patience is bring out great outcome. I love baklava but, you are right, the store bought ones are just too drenched in syrup. Yours look so crisp. Very nice. I have such a sweet tooth as well, and this sounds so good. 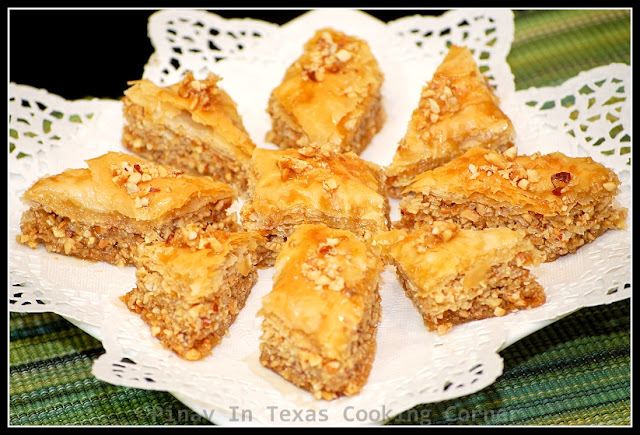 I've never had Baklava before, or made it but thinking it is a must try! Sounds so good. 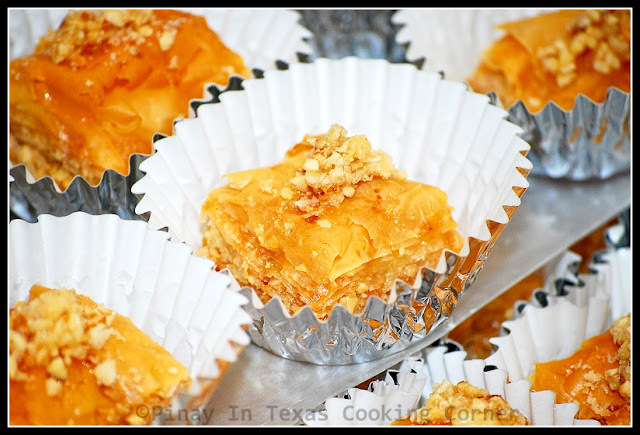 i loooooooooove baklava...will definitely have to make this next time i have a special occasion! I Love Baklava! I worked with a girl whose mom made Baklava it is awesome! 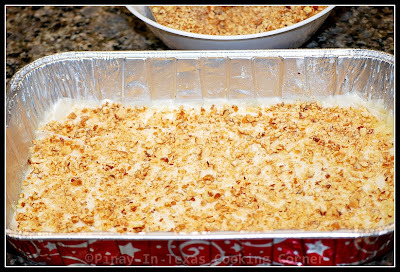 I'm hosting my first link party today Cast Party Wednesday I would love it if you would come over and share this tasty recipe. Wowser I love this stuff! Thanks for linking with the Hearth n Soul hop. Like you I reduce the sugar a lot in my baking as I like it a little less sweet. Your baklava sounds perfect for me. I'll have to give it a try one of these days. Great idea to serve the slices in cupcake liners.